What makes a Delicious Camping Menu? First off, the food needs to be easy to find, simple to prepare and appeal to most people’s taste buds. If you agree, check out my wilderness camping ebook for food that everyone loves. These two menus are meant for both car camping / drive in camping and interior wilderness camping , as planning a trip is different for both these types of camping. 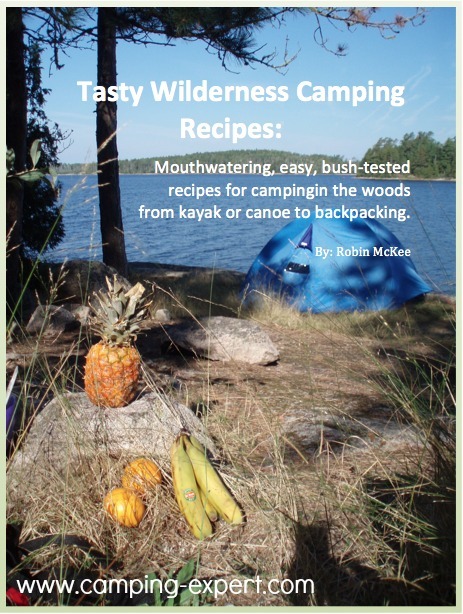 If you want a great menu with all the recipes, check out my wilderness recipe ebook. This page has a sample menu for both a 5 day Car Camping trip and a 5-day Interior Canoe or Backpacking Camping trip. For other ideas check out Camping food ideas, or Backpacking Recipes included my ebook. Many times, I’ll have the same meal for breakfast EVERY day, but that’s just to keep it simple for myself, and cause I’m pretty easy to please. I eat to live, not live to eat. Some people love variety, so the menus above will help to give some new ideas. You can repeat some of the meals, or check out my other food pages. I also prefer no-cook lunches so that it’s something easy, so I don’t have to pull out a bunch of gear spend all day cooking. For interior camping, I try and bring fresh stuff for the first few days. It’s heavier, however if you’re doing an extended trip, those few days of fresh food will make it worth it. Who can complain about a fresh orange on day 3 in the middle of the woods? If you want more ideas, check out Camping food list and Backpacking recipe ebook.